What big sister wouldn't love to make a statement with this fabulous CHARM IT! Big Sister charm with its sparkly stones, white enamel letters, black enamel background, and shiny pink outlines and accents? This CHARM IT! 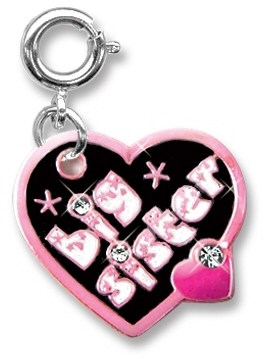 Big Sister charm is a must-have for big sisters everywhere! With a simple snap of a clasp, girls can personalize their CHARM IT! jewelry with this fun CHARM IT! Big Sister charm.